Power producer KenGen and Geothermal Development Company (GDC) are locked in a supremacy tussle. About the largest electricity producing well!!!!! This is how geothermal development in Kenya today. Very healthy competition. The government-owned companies each claim their geothermal wells are the largest in Kenya and in Africa. This rivalry was again brought to light last week during the One Planet Summit in Nairobi meant to ignite discourse around green energy transition and climate change. KenGen claimed its single most productive well in Naivasha’s Olkaria steamfields is the largest in Africa and among the top five globally with a capacity to produce 30 megawatts (MW) of geothermal electricity. This is Olkaria OW-921, sunk five years ago at a depth of 3km underneath the ground. On the other hand, the Geothermal Development Company (GDC) holds that the Africa title goes to its Well 1A at Menengai fields in Nakuru, since its capacity of 30.6 MW is slightly higher than KenGen’s best performing well at 30 MW. It is a question of 0.6 MWe!! It is like school children comparing their score cards. A standard well on average yields only five megawatts 4 to 5 MWe. This means KenGen’s and GDC wonder wells are each equivalent to six wells. Drilling a single well costs an average $5 million (Sh500 million). Some wells turn out dry, returning losses to investors in terms of sunk costs. But such wonder wells compensate the losses. 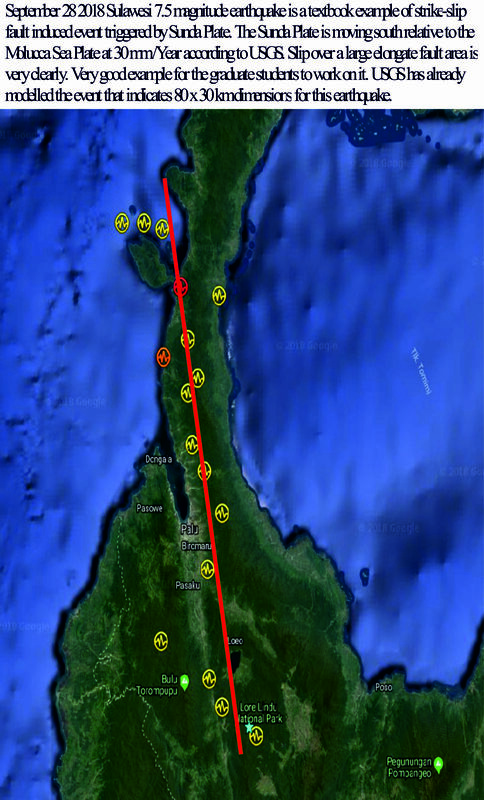 Other super wells are those in Indonesia (40 MWe per well) and California. GDC is fully owned by the government while KenGen, which is listed on the Nairobi Securities Kenya is currently ranked the ninth largest producer of geothermal electricity in the world and the leader in Africa with a capacity of 690 MWe. Kenya’s power demand hits 1,832 MWe. Hydro power is other major source contributing to meet this demand. Solar photo voltaic is classified as renewable energy source because it captures the SUN’s energy and “converts” it to electricity. So SUN’s energy is renewable and not the energy converters like solar cells! Let us understand how solar cells are manufactured. A life cycle of a solar cell starts from the mining and processing of materials. This material is basically silica in the form of minerals and rocks like quartz and quartzite. Then comes the solar cells that are made from the refined silicon from these mineral and rock. The cells are then fixed in modules, generally a metal made from naturally occurring material. From the solar panels the flow goes into storage system like lithium based batteries. The lithium is mined from open cast or underground mines or extracted from minerals like spodumene or lithium bearing mica. Everything has to come from earth!! Once the solar panels and batteries complete their function, they are decommissioned and the materials some times are recycled or disposed of. The cost associated with the manufacturing of the cells to batteries are embedded in the cost of electricity that the cells generated from the Sun. But there are other costs known as the external costs. They included environmental, health and societal. These costs are well quantified by European Union’s series of “ExternE” (External cost of Energy) projects. This includes emissions generated from the manufacturing of cells, atmospheric dispersions and respiratory issues associated with such dispersions. They are not imbedded in the cost of electricity. This ExternE helps in policy decisions by the energy and transport sectors. In the latest ExternE report published by the European Commission states that photovoltaic installations in Germany has 30% higher health impacts than natural gas and Green House Gas emissions of 180 g CO2 equivalent/kWh generated is 10 times higher than the electricity generated from nuclear fuels. According to the ExternE report, the results are based on greater than 15 years old solr pv installations and module production technology. Similar study by Australia showed that solar pv emits about 100 g of CO2 equivalent/kWh of electricity generated. A paper published by Fthenakis and Alsema in 2006 (Prog. Photovolt: Res. Appl. 2006; 14:275–280) states that the 94% of the PV system modules in 2004 that were installed to generate about 1250 MW were made of silicon. These authors with the cooperation of several European and US photovoltaic companies carried out extensive study on the life cycle inventory data that represent the present status of production technology of crystalline silicon modules (mono and multicrystalline) for rooftop pv systems. The results of the study by Germany and Australia are similar (Fig 1) very similar. The ExternE cost for health and environment estimated for solar insolation of 1700 kWh/m2/yr is about euro 0.18/kWh and for solar insolation of 1300kWh/m2/yr would be euro 0.23/kWh. This study reports that the CO2 emissions under the above conditions vary between 21 to 59 g CO2 eqi/kWh. Although this emission is less than that emitted by coal based thermal power plants, it is significant when GW are considered. At 15 % efficiency a 1 KW solar pv will emit 75 kg of CO2 during its life cycle. Manufacturing of solar pv cells is an energy intensive process, starting from mining of material, transportation, smelting, processing and manufacturing. In the entire cycle of production the main energy source is either coal based thermal power plants or electricity generated from hydroelectric power stations. Thus preparation of solar cell is closely associated with CO2 and other gases emissions as quantified above. Manufacturing of a single solar cell is associated with a large number of ancillary industries. Mining, metallurgical, electronics and other metal manufacturing industries are closely associated with the manufacturing of solar cells. By not promoting solar pv all these ancillary industries will collapse and the country’s GDP will dip….especially some of the European countries that are vehemently promote solar pv!! To prepare 1 m2 of sc-Si module the electricity required is 4620 kWh. To generate 4620 kWh 2.17 tons of coal is required (40% efficiency) and the CO2 emission is 5810 kg. To generate 1 MW of electricity nearly 14000 sc-Si modules are needed that will occupy about 4 acres of land. Thus to generate about 1.368 million kWh of electricity, the solar cells, during its life cycle, will generate huge amount of CO2. This does not include the batteries ( lithium) needed for storing the electricity generated. Along side the main CoP 24 conference in Poland, several side discussions are being held to focus current issues related to reduction of CO2 emissions. One such discussion being held in Washington, DC is related to the preparedness of Arab countries to tackle climate change. All the gulf countries and sub-Saharan countries will be the most affected regions of the world due to climate change and weather vagaries. Among the most affected are countries like Djibouti and Eritrea and oil rich countries are no better than these countries. These countries are vulnerable to food and water security in the near future due to climate change. For Eritrea agriculture contributes 12 % to the country’s GDP. Soil erosion is the greatest problem for the country that is decreasing the cultivable land for agriculture. Several dams have been constructed to store surface water and several bore holes have been drilled for irrigation. Due to poor rainfall such exercises have proved futile and the country is heavily dependent on food imports. Although estimated groundwater potential is about 500 x 106 m3, the demand is much higher than this estimate. It is around 2540 x 106 m3. Oil rich countries like Saudi Arabia has increased its wheat imports from 1.9 to 3.1 million tonne. But fresh water is needed for the live stock and Date farms (agriculture contributes 3% to the GDP!).. The country heavily depends on desalination using fossil fuels. Not economical at all. The desalinated water is costly but for the Govt. subsidy is sold at 0.03 US$/m3. While the average global cost is 6 US$ / m3. The side discussions/conferences may be attended by top official with strong academic tags but the ground reality is to use renewable energy for desalination. 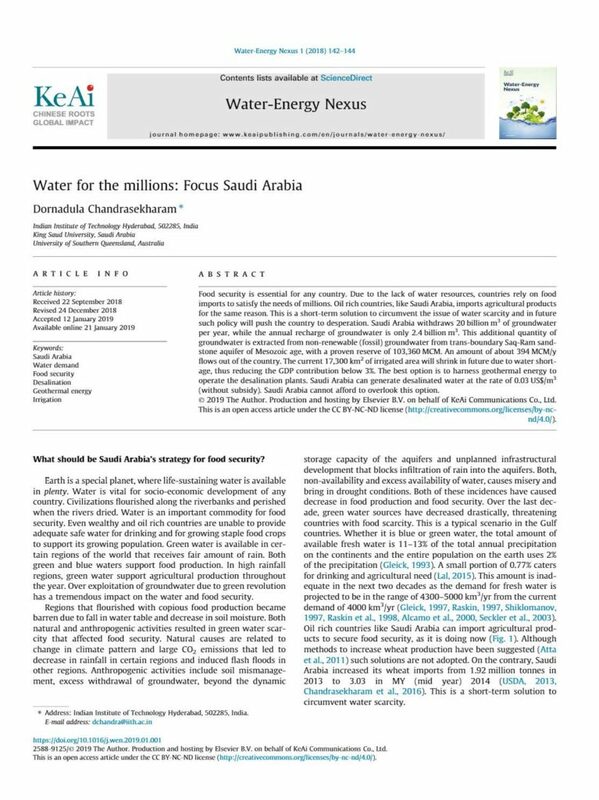 So the entire focus of the Gulf countries (including sub Saharan countries) to find out methods to increase the production of desalinated water using renewable energy (with low carbon foot print) and reduce dependency on food imports. This what should be preached at such conferences by the educated elite. Countries with geothermal energy resources should augment the process of development of this energy source for desalination there by securing country’s food and water security. According to the recent report (2018) published by the International Energy Agency, geothermal energy capacity is set to grow by 28% amounting to 17 GWe by the year 2023. More and more countries are exploiting their untapped sources to reduce carbon dioxide emissions and control the use of fossil based electricity. China alone has shown the largest growth of 2 GW in the last couple of years. Indonesia followed by Kenya are the leaders in expanding their geothermal base, increasing to the tune of 30%. Although pre-development risks are still the barrier for development, such barriers can be overcome by skillful planning and good data interpretation. In addition the drilling cost are showing downward trend due to technological improvement. In future, with the advent of plasma drilling and development of Enhanced Geothermal Systems, growth of this industry will see exponential rise. Low CO2 emissions, baseload power, high efficiency and small lad foot print are some of the factors that is attracting the geothermal sector in several developing countries. Soon this sector will add additional 20% amounting to 900 MW. The main additions are from Kenya ( 180 MW) and Indonesia. Philippines and Turkey will be add another 70 MW. Countries like Japan, England, China, France and Germany have initiated EGS projects that are at different stages of development. Direct application projects are showing a surge due to technological development in ground source heat pumps. What a marvellous achievement by DEEP, the Canadian Geothermal Developer. The entire work went unnoticed. 3 Km deep drilling and extracting heat usig submersible pumps to generate initially 5 MWe and after the testing will be escalated to 10 MWe. Saskatchewan- is the location where this project is coming up. DEEP is planning to drill upto 3.5Km in 25 days. 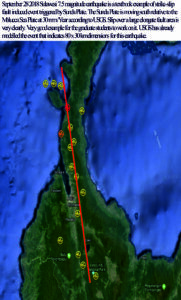 The temperatures are expected to be around 126 C. A total of 5 wells are planned —–three production and two injection wells. According a news release a news release from the company says the plant would generate renewable and zero-emission power. It would also offset 27,000 tonnes of carbon dioxide per year by producing five megawatts of electricity, which is the equivalent of taking about 7,400 cars off the roads annually. The oil and gas drilling industry discovered this site and the resource.
. According to the CEO of DEEP this power will out beat solar and wind since operating and maintenance cost will be less than the other renewable sources. No one expected that Canada will be geothermally powered. Sask-Power signed a power purchase agreement in 2017 which would enable the Crown corporation to buy power from the plant, and help reduce emissions from by 40 per cent by 2030 compared to 2005 levels. IPCC Oct 2018 and 1.5 C scenario. Ambitious mitigation actions to limit global warming to 1.5 C, according to October 2019 IPCC report is to focus on ‘climate-resilient development pathways’ which aim to meet the goals of sustainable development, including climate adaptation and mitigation, poverty eradication and reducing inequalities”” The report further highlights that “ there is no single answer to the question of whether it is feasible to limit warming to 1.5 C and adapt to the consequences”. Thus there are so many highly sounding jargon phrases and words engulf the entire report. To add another jargon to this is the “energy-water-food nexus”. Unlike others, here there is no hidden meaning, political web, intergovernmental feuds and best governance. Countries are going to face acute food and water crisis soon and the most affected are the Gulf countries and Sub-Saharan countries. Those countries rich in oil resources burn is extensively to generate fresh water to sustain the growing demand for food and those oil impoverished countries depend extensively on VWT (Virtual Water Trade) to support food demand. These two processes going to influence the global warming to a large extent. IPCC should focus on this crucial aspect and impress on the governments to find out methods to increase fresh water production without using fossil fuels. Apart from power production, generation of freshwater using fossil fuels releases enormous amount of carbon dioxide. Now it becomes a full circle…..to generate freshwater renewables are the first and the best option but all renewables are not alike. The world is obsessed with solar pv. Certainly this is one of the options where ever it is cost effective and does not occupy productive land resources. There is an equal and most suitable option that is not being discussed or highlighted in most of the reports. Like Sun Earth has enormous amount of heat that is lying untapped. When one talks about geothermal people think of hydrothermal resources and forget the amount of energy one can extract from granites. Land requirement, performance, efficiency and supply of base-load electricity supply…..these factors inherent in EGS can out beat any of the renewables. No lithium batteries, no storage systems, no subsidies and no supporting ancillary industries needed for EGS. Now with plasma drilling technology maturing, tapping Earth’s heat is easy and is available at every ones back-yard. Governments, if serious about reducing CO2 emissions to limit the global temperature rise to 1.5 C, then a concentrated effort to promote renewables is a must. Even though this is not the mandate of IPCC yet a separate chapter or a session with CoP can be held as a side conference to emphasise and thrust the development of EGS in all the countries. There have been IPCC report and reports and CoPs. All the efforts however could not stop the global warming…it is rising day by day and year by year and affecting the poverty ridden countries. Will such meeting and reports continue to fill the libraries and offices or will there be concrete steps to really control the temperature phenomena is poorly understood. Argentina, Australia, China and Chile are the four countries that have large lithium reserves ranging from 2 million to 7.5 million metric tons. Other countries do have but not much exploration work has been carried out. It is expected that demand for lithium carbonate equivalent will grow beyond 1.8 million tonnes from the current 200 00 tonnes. Apart from lithium bearing minerals, focus should be on geothermal resources. Water rock interaction between the circulating fluids and rocks extract sizable quantities of lithium that can be extracted. Besides this large mine-waste contain easily extractable lithium that has not attracted the attention of the investors. If the renewable industry has to grow then this metals has to come from renewable energy source itself…geothermal. Identification of sources, extraction methods are the future research areas that institutes and industries should follow. A large number of geothermal provinces do have lithium in extractable quantitates and even if the metal is in traces still there are procedures to extract it in a economical way. This may bring down the cost. Look for my article that will soon appear in the journals.